Hi, I'm Takahashi from the Planning and Development Department. I worked as the director for the Everybody Votes Channel. I'm Masaoka from the Planning and Development Department. I was responsible for programming things like the interface screen. I am Nakagawa, and I'm also from the Planning and Development Department. I was in charge of the programs for things like the Mii movements. I'm Fujikawa from the Research and Development Department. I was responsible in setting the servers, like the way they exchange voting results with Wii consoles. I am Oue from the Information Systems Department. I worked on the various server settings, and the program that sends new questions to Wii consoles. I am Seki from the Planning and Development Department. I worked on the Design. In the Everybody Votes Channel, you place your vote by choosing from one of the two answers that are provided to each of the polls, and you have fun looking at the voting results and predicting which answer will get the most votes. I thought it would be great if people could find out new things, like finding out what you thought was common sense was actually not, and be able to see how the results differ depending on where people lived, by their region or by country. The Everybody Votes Channel originally started from an idea about sending daily quizzes and questions. At first, the channel's name was straightforward, it was called the Questionnaire Channel. But while it was being developed, I was thinking we should differentiate it from all the other voting websites available on the Internet, to make it easy to get into, and make the experience stress-free. It was most likely going to be used with the living room TV, so I wanted to make it so that both the grandma and her grandchild could enjoy. For example, if there was a question like "Who do you like more, Mario or Link? ", the grandma might not understand. We want to stay away from doing things like that. It's made so that you can tell what somebody else in your family voted for, because I wanted everybody in the family to have fun with it. By showing what you voted for to other people, I thought it would be a great conversation starter for the family. If the question was asking whether you like udon or soba, you might be surprised to discover things you didn't know of before, like mom liked udon more than soba. Because we wanted everyone to have fun talking about what's going to be the right answer, we designed the poll and the predictions so everybody can play at the same time. Everybody Votes Channel started on February 14th, on a Wednesday. It started without any notice, and I'm sure a lot of people were surprised by its sudden release. However, we had so many people cast their votes. There were two types of polls, a National Poll and a Worldwide Poll, and the first Worldwide Poll received about 500,000 votes in two days. Even Japan's National Poll received about 100,000 votes. During development, we were only checking with 60 or so votes to see if it was working. All the sudden the number exploded to 500,000, so you can't blame me for being surprised! (laughs) It's made so you can't vote on the same question twice, giving these numbers even more meaning. Unlike ordinary polls on the Internet, a single person is not able to cast multiple votes, so these numbers are very genuine. Japan's first question was "Which do you like, udon or soba? 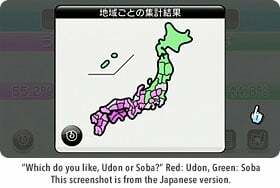 ",1 and when the poll result were in, the map displayed what prefectures voted for which, and when I saw the map of Japan being clearly divided in two by udon and soba, I was really impressed. I had shivers going down my spine! It seemed like 100,000 people in Japan held serious debates and discussions over udon and soba, so as the person who took part in making it, I felt very happy. There were some people who were confused about the prefectures. They thought that those without any color were the ones that did not cast any votes, but they're actually prefectures where the voting results were just about equal. Of course we run detailed simulations if the numbers of votes do increase. Even though the severs ran without issue, I still can't say that I absolutely have no worries... (laughs) Of course, it is fun watching the number of votes grow. On top of the poll numbers, what I was also surprised about was the feature where the users can send their poll suggestions. We received close to 10,000 suggestions on the first day, and for the worldwide suggestions, we received close to 40,000 of them. The main purpose of this Channel was to place your votes, so the suggestion feature was put in there as an extra feature of sorts. I was imagining that about one in ten people would write in their suggestions, so I was very happy to see it receive this much of a response. It made me think how everyone has all these things they want to ask the world about. By the way, the first poll in America was supposed to be "Can you whistle or cannot whistle?" But that changed on the day before release. We had a request from NOA (Nintendo of America), asking us to change it to "Which is a more romantic Valentine's gift? Chocolates or Roses?" 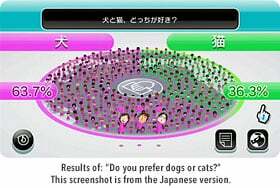 The first worldwide poll was "Do you prefer dogs or cats?" It's a little weird to say, but because of this question, there were countries that became more famous and talked about in Japan because of it. To be accurate it's the Republic of Guatemala, and the country is located next to Mexico in Central America. They had so many dog lovers, they appeared at the top of the list when you displayed the results by country. We were actually talking about when you see the color ratio for Guatemala on that country graph, it didn't seem like it was cast by just two or three people. There seemed to be at least ten or so that voted. I think the actual number of people who voted was 62. It was very emotional to find out that so many people in different countries play Wii. 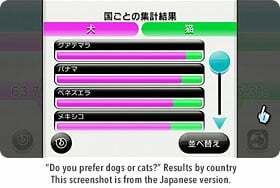 German was especially difficult, even though it was the same poll, it had to be displayed in two rows because the words were longer, where the same question can be displayed in one row if it was in Japanese. I kept working thinking to myself "This is a lot of work!" There are countless polls on the Internet, and to be honest, at first I was thinking what was the meaning behind this Everybody Votes Channel, but when you think about it, the concept of collecting votes across the world is really new. Thinking about it now, I think it was really worth our while seeing how this many people around the world are having fun with it. It was truly a work that connected globally. We also gave a lot of thought into the Channel's name. At first, it was called the "Questionnaire Channel", but it sounded like the Channel would be there to just collect and research data. There was also one called "Citizens Votes Channel", but that sounded a little too square. Eventually, we put the word "Everybody" taken from the concept of how we wanted everybody in the family to have fun to the beginning of the name, and it became the "Everybody Votes Channel". I heard that about the time when I thought we were done! (laughs) But, I do think that it's better that we have these features. All the polls are categorized into five categories. For example, the poll "Have you ever gone on a vacation overseas? ", would be categorized in "Experience". When you put in your predictions about whether the majority of the general public did go overseas or not, if you got that prediction right, your tuned in rate for the Experience category increases. 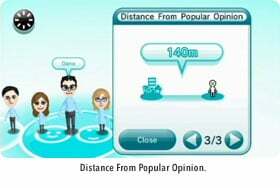 On the other hand, the Distance From Popular Opinion looks at situations like when you liked soba but udon was the majority, and will count that as you having a distance from popular opinion, and the distance will increase as you answer in a similar manner. With the design, at first we were talking about using sketch-styled faces to appeal its casual style. However, we felt that wasn't enough. 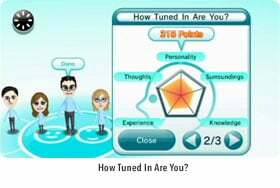 As I was also involved with the Mii Channel, the idea of using Miis naturally came along. At first it only displayed the Mii's face, but everyone looked like they were having so much fun looking at their Miis moving around. That's why we gave them bodies and had them run around. Our main goal was to make it as easy to understand as possible, but we also made sure to put in a lot of fun features that just make you giggle, like how the Miis run around diagonally and twists their heads. Especially with the way they move, that was a part where the Miis made in the Mii Channel were brought to life. 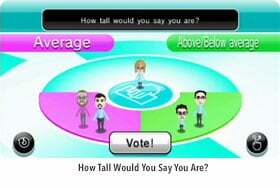 How you vote with your own Mii made a big difference. It wasn't intentional, but when you're about to vote and grab your Mii, you get this strange feeling that makes you think, "This is my vote, so I really have to think about it." This is about my friend's house, but he's not sure if it's because everyone in his family put all their first votes in at the same time, the child now wouldn't want to look at the results alone. It's so easy for the child to just look at the results, but the child doesn't want to look until daddy's home, so they can watch the results together. The child might especially feel this way because they're Miis. So the Channel can be enjoyed for a long period of time, the timing to send out new polls were also important. Things like the polls had two answers, and are sent out three times per week, were decided early on. There were plans of having one poll a day, but that might have been a little overwhelming, so we went with three polls per week. I think the balance turned out to be something that if you actually tried it out, you don't feel obligated to do it as if it was something you had to do everyday, yet it didn't feel like it had too much of a gap in between. The Worldwide Poll was first set at once per month, but we felt that it was too little, so it's been increased to twice a month. The reason we had the Everybody Votes Channel start on February 14th, which fell on a Thursday, was so that if you cast your vote on Thursday, you can see the first National Poll results on Friday the 15th. Then on Saturday the 16th, you can see the results of the first Worldwide Poll, and on Sunday the 17th, you can see the second National Poll results. We wanted to make it so the users could look at their results on the 15th, 16th, and the 17th. We made a proposal to Iwata-san asking if we could have the Channel begin on the 14th. I do feel that there's something great going on right in front of our eyes. On February 14th, our customers' Wii consoles suddenly glowed blue, and two days later, we received 500,000 votes. I was simply, really move by that. 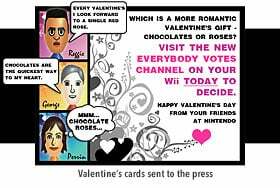 What I wanted to play the most with Wii was this Everybody Votes Channel. Seeing it come to life, and thinking how 100,000 people were seriously discussing and predicting about udon and soba. This may be trivial, but the fact that something this plain and simple is being done in such a grand scale makes me happy. That's right. But once the service started, people started having fun with it. I felt that we made something that has been taken in by our users in a way that's unlike anything else before. But because it has been taken in this way, I do feel that I want to make this Channel even better. For example, I would like to think of a way to smoothly utilize the pile of poll suggestions we're receiving. A system that could automatically read what kind of suggestions we receive more of, sounds very interesting. On several occasions, I had several people from other teams within the company come up to me and ask if this Channel's voting system could be used in other software. I hadn't even thought about it until then, but I think in the future, it has the possibility to expand in that kind of a way. Now that the framework called the Everybody Votes Channel is complete, we can now start to understand what kind of poll would be fun. I think we'll continue to receive poll suggestions from our users, so I would like to put those poll in to further make the Channel more exciting. 1. Udon and Soba are two popular noodles in Japan. Udon is wheat-based, and soba is made of buckwheat. 2. Soki Soba is a traditional noodle popular in Okinawa, Japan's southernmost prefecture. Made of wheat, the soba is technically a type of udon, but the people in Okinawa voted for "soba" because that is the way the noodle has been called over the generations. The soki is pork spare ribs, placed on the soba when it is served.